Postmaster General Patrick Donahoe faces a Senate panel on Wednesday. A week after declaring that the Postal Service will no longer deliver letters on Saturdays starting in August, U.S. Postmaster General Patrick Donahoe on Wednesday faced questions from members of Congress over whether he has the legal authority to take such a step. Last week, Donahoe announced that Saturday delivery of most mail will end on Aug. 5, although packages and deliveries to post office boxes would continue. Appearing before the Senate Committee on Homeland Security and Governmental Affairs, Donahoe defended the "courageous, aggressive and controversial" Saturday delivery cuts. He said it was part of a broader effort to stem the bleeding at the agency, which just reported a $1.3 billion loss for the three months ended Dec. 31. Other cost-cutting moves the agency is pursuing include cutting post office hours, consolidating postal plants and creating its own healthcare program for employees. Critics, unions and some lawmakers have questioned whether the Postal Service has the power to end Saturday delivery without Congress' OK. In the past, the agency said federal law prevented such a move. Donahoe insisted that his attorneys have said the agency can make that move. But Sen. Mark Pryor, an Arkansas Democrat, said he isn't convinced. "You've said you're satisfied that you have the legal authority, I'm not. And I'm not sure the committee is. And I'm not sure the Congress is," Pryor said. Donahoe begged the panel to not pass a law stopping the agency from cutting Saturday service. 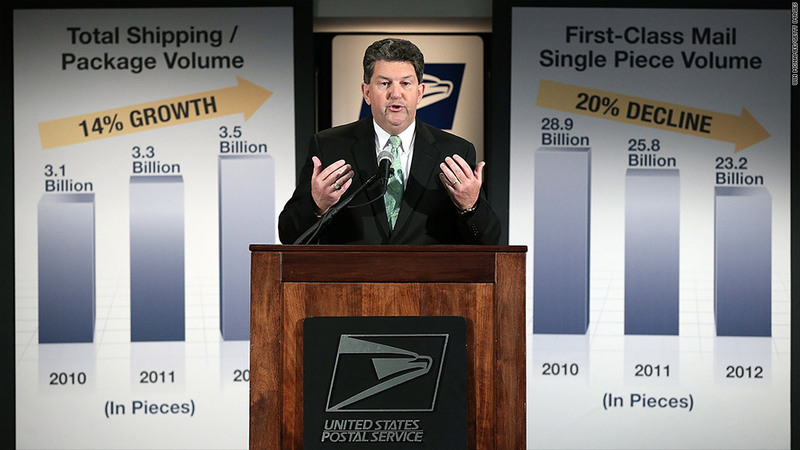 "You don't want the postal service to fail in this country," Donahoe said. "I'm imploring Congress, please do not force us into a six-day window." The Postal Service's woes were exacerbated after a 2006 congressional mandate required it to pre-fund healthcare benefits for future retirees. The USPS has been borrowing billions of dollars from taxpayers to make up for the shortfalls. At the same time, technological advances have led to a decline in first-class mail, which most consumers use to pay bills and stay in touch. Donahoe stressed that resolving the "prefunding requirement alone will not fully address the problem," at the Postal Service. He pointed to a drop in first-class mail by 40% over the past 5 years. But union chiefs argued the Postal Service could fix its problems by hiking rates on first-class mail and getting rid of its prefunding mandate. They oppose moves to cut service, such as on Saturdays, that would drive more customers away. "The USPS has already made deep cuts to service; slashing service further will only weaken this great institution, make it less relevant and less competitive," said Cliff Guffey, president of the American Postal Workers Union. Some senators, especially those from rural areas, questioned the cuts that the Postal Service has made. "We're changing mail standards in rural America," said Sen. Jon Tester of Montana. "If I have a piece of mail that has to go somewhere, and it has to be there on a date and time, specific, you've got to be competitive or I'm not going to use you." Donahoe defended the agency's cuts and insisted: "We're still the best solution out there."